Note: Use a very large mixing bowl to make this recipe as the batter will double in size as it rises. Combine the yeast and the water in a large mixing bowl and let stand for a few minutes. Stir to make sure the yeast dissolves into the water. Melt the butter over low heat or in the microwave. Combine the butter with the milk, salt, and sugar (if using). Test with your finger to make sure the mixture has cooled to luke warm, then stir it into the dissolved yeast mixture. Add the flour and stir until a thick, shaggy dough is formed and there is no more visible flour. Cover the bowl with plastic wrap and let it sit on the counter overnight. The batter will double or triple in bulk as it rises. The next morning, beat the eggs together and add them to the batter along with the baking soda. Using a whisk or hand blender, beat the eggs and baking soda into the batter until completely combined. Make the waffles according to your waffle maker’s instructions, cooking until the waffles are golden-brown. Cooking time will vary with your waffle maker, but it is typically 4 to 6 minutes. Waffles are best if served immediately, but re-heat well in the toaster. Leftovers can be kept refrigerated for up to a week. 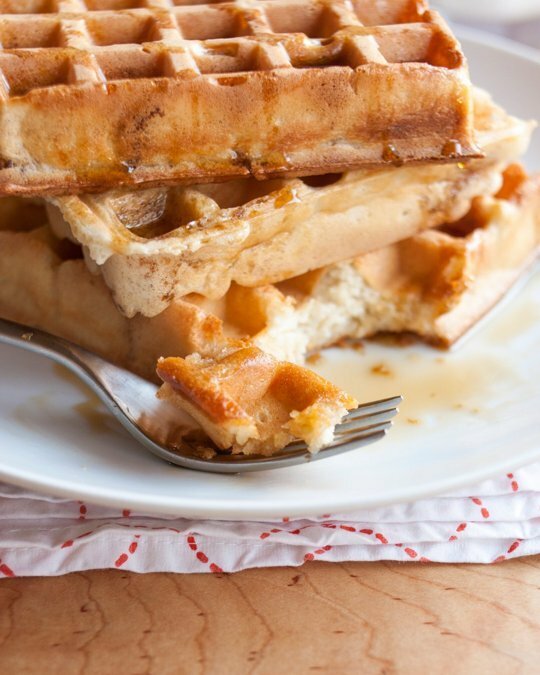 Leftover waffles can also be frozen for up to 3 months and toasted straight out of the freezer. •	Double-Batch Waffle Recipe: 1 tablespoon active dry yeast, 1 cup warm water, 1 cup (2 sticks) unsalted butter, 4 cups whole or 2% milk, 2 teaspoons salt, 1/4 cup sugar (optional), 6 cups all-purpose flour, 4 large eggs (added the next day), 1 teaspoon baking soda (added the next day).